FA Cup Fever – tennis style – swept through Wolverhampton Lawn Tennis & Squash Club on Saturday night as the popular annual knockout competition came to its conclusion. A total of 104 players took part in the doubles event based on the world-famous football competition, which, unlike the club’s annual championships in the summer, is not divided into standards of entries. The only grading are separate ‘A’ and ‘B’ sections, but, that apart, it is very much the ‘luck of the draw’ with the pairs going into the hat each round for a draw which took place live on Facebook. A sizeable crowd enjoyed the finals evening, which aimed to follow the example of the ATP Finals staged at the 02 Arena complete with lighting and music helping to create a lively spectacle. 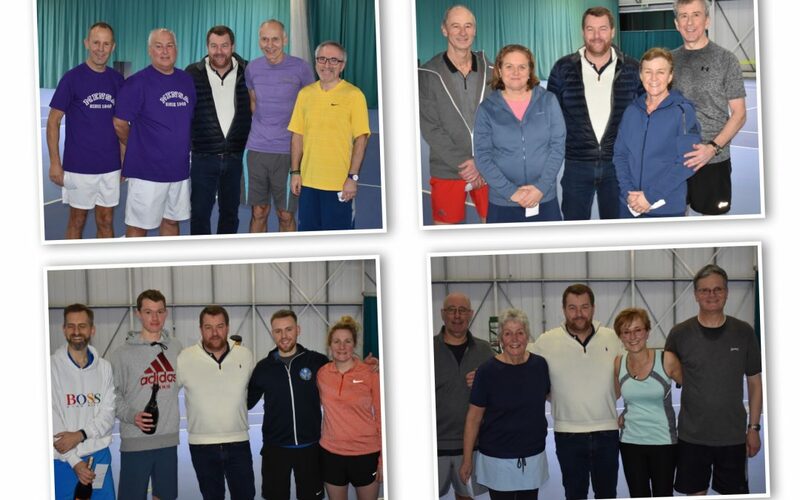 In the main cup final, Ross Fletcher and Peter Strouhal defeated Ben Webb and Louise Scott in straight sets, whilst in the ‘B’ final, Robin and Jo Birch overcame Chris and Lesley Quick. Robin Chipperfield and Mark Brown beat John Stevenage and Simon Calrow in the ‘A’ plate final, whilst Jon and Ally Rogers won against Alan Hadley and Beth Francis in the ‘B’ plate shootout. “This is the fifth year we have run the FA Cup competition, which is something a little bit different to encourage people to carry on playing tennis through the Winter months,” says Paul Hodgetts, Everypoint Rackets manager at WLTSC. “In contrast to the club championships, the very best players at the club are not eligible to enter, and, with it being a knockout draw, there is a great chance for players to make progress who otherwise might find it difficult. “We still ended up with a high quality of tennis in the finals from players of various ages and abilities, as well as a good crowd to enjoy the entertainment.